Dr. Balcerzak talked with SocialWorkersSpeak.org about her personal experiences with workplace bullying, its common signs and symptoms, and her recommended coping strategies. Balcerzak: My original intent was to become a fashion merchandiser, but midway through my Bachelor’s degree I realized that I wanted to be a psychotherapist, so I changed my major to psychology. In Michigan at that time, the avenues for being a clinician were either to obtain an MSW or to pursue a PhD in psychology. I opted for an MSW. I did work for a crisis intervention program in a rural community in southern Michigan prior to beginning my graduate studies. That excellent experience gave me further clarification that I wanted advanced studies and a degree with flexibility and mobility. My MSW degree met my needs very well and, upon completion, I launched my career as a therapist. After arriving in California in 1980, I obtained a California license as a clinical social worker. My work has included direct clinical practice in a variety of settings, the provision of clinical supervision to students and interns, administration in a public health care setting, teaching and program development at the community college level of education, and graduate instruction in psychology, social work, and addiction studies. I discovered International University for Graduate Studies in 2002 and earned two doctoral degrees with IUGS. As a lifelong social worker, social work’s commitment to human rights and social justice have been consistent with my values system. Q. What inspired you to write Workplace Bullying: Clinical and Organizational Perspectives? How did you conduct research for the book? Balcerzak: My dissertation for my doctorate in organizational psychology (2010) focused on workplace bullying. Every few months, I would do a data search and retrieve new articles on the subject. What surprised me was that very few of the over 225 studies I found originated in the United States. Most of the earlier studies were done in Scandinavia and Western Europe. After completing the doctoral process, I wanted to take the project further. I had learned so much about workplace bullying and wanted to share my knowledge with a larger population, especially social workers and other clinicians. As a social worker since 1977, I was particularly surprised that my own discipline, so committed to social justice and advocacy, had (as of 2013) said very little about the subject. I approached NASW Press with the hope that I could make a contribution to social work’s body of knowledge. Q. What are the common signs and symptoms of workplace bullying? Are there specific professions, leadership styles, or organizational practices that are particularly high-risk? Because targets are so often isolated, self-blame is common along with confusion. In addition to psycho-physiological symptoms that resemble depression, anxiety and panic are common. Like others in crisis, targets often experience a loss of normal coping mechanisms and can feel desperate. Victims of workplace bullying may develop health conditions that require a leave of absence. In severe cases, a target can become permanently disabled and unable to return to work. Fortunate are those who make career changes and relocate to a healthier work environment. Q. Why do you think workplace bullying is not often discussed at an organizational or national level? Balcerzak: Denial is probably the biggest reason employers don’t address bullying. At an organizational level, there are multiple reasons that workplace bullying is often ignored and a number of costs and benefits may contribute to organizational blindness. Workplace structures and practices may not effectively deal with bullying when it occurs. If the bully is the boss, there may be little the organization can do to curb abusive behavior. Some authors suggest that bullying by individuals or groups will only occur if offenders believe they have the support of management or if the consequences for emotional harm to others are minimal. Most importantly, Dr. Yamada advocates making human dignity central to American employment law and policy. Unfortunately, like most social change processes, the United States has been among the most resistant to adopting such practices. Unlike Scandinavia, Western Europe, and the United Kingdom, the United States has few laws to protect workers from workplace emotional abuse unless workers belong to an expressly protected class. Q. Have you ever personally experienced workplace bullying? How did you handle the situation? Balcerzak: Unfortunately, I did experience workplace bullying while working in the public sector almost 20 years ago. It was a difficult time in the life of our department and there were high levels of stress and uncertainty. I was in a very visible leadership position during a time of rapid change and was targeted by an agency director. I did not understand what was happening at the time nor did many of my professional colleagues, including other social workers, who were outside the situation. Internally, my co-workers and employees were with me in the eye of that storm and observed what was happening. They offered support but had little actual power to help me. At the insistence of my physician, I took a leave of absence to recover and to look for alternative employment. This is one of the reasons I advocate so strongly for physicians to be aware of this phenomenon and take steps to ensure the health and well-being of injured workers. Looking back, the experience was instrumental in my making major career changes that have been productive and joyful—two doctorates, a book, a second career in higher education, the creation of a non-profit counseling program, becoming a continuing education provider in California, and considerable training and consulting. The list goes on. At the time, I could not have predicted such a good outcome because the experience was devastating and my health suffered. Q. What guidance would you offer to someone currently experiencing workplace bullying? Balcerzak: First, victims need to realize what is happening to them and attempt to remedy situations informally. Since bullying often has its roots in unresolved conflict, a healthy start would be to attempt to work things out with good conflict management skills by communicating assertively but diplomatically, and by examining any personal responsibility for provoking attacks. If personal advocacy is not effective, targets should seek help from human resources and employee assistance programs. They should keep in mind, however, that these functions in the organization are often administered by employers who may or may not be sympathetic to their plight. If health is beginning to suffer, victims should seek medical care by their own physicians to monitor their health and to establish baseline data on vital functioning. If symptoms persist or worsen, targets should not hesitate to take a leave of absence. Targets will likely benefit from entering some supportive therapy with a therapist that understands the trauma of workplace bullying and who can assist with problem solving, stress management, trauma survival, and grief work. They should also seek legal advice from an attorney who both specializes in labor law and understands workplace bullying. Targets will need to consider if they are willing to embark on a legal battle which has uncertain outcomes. While some cases are won in favor of emotionally injured workers, these are not easy litigation processes. Unfortunately, job change may be the ultimate solution and targets may need to seek alternate employment. This may involve midlife career changes and/or further education and training (and more grief work). Finally, victims will be wise to document, document, document from the beginning of the difficulty through resolution or departure. Balcerzak: My hope is that social workers will understand workplace bullying as a type of violence that our profession should be addressing as it has addressed other issues like child abuse, elder abuse, mental health, and substance abuse. Because injured targets can become disabled and have difficulty continuing to work or returning to work, bullying has a significant health impact that social workers need to understand. My other hopes are around treatment issues, organizational functioning issues, and policy matters. Clinicians need to understand the needs of emotionally injured workers, particularly the level of trauma that bullied workers experience. Using treatment interventions designed to help injured clients survive, make life changing decisions, and even career changes are imperative. Clinicians cannot be helpful if they don’t understand what the bullied person has suffered. Because many social workers work in administration of large organizations or provide consulting to organizations, my chapter on organizational interventions will be relevant. From a public policy perspective, social work should join the movement to encourage legislation by the states for better protection of workers with efforts like the Healthy Workplace Bill. Balcerzak: As I tell my students and advisees considering a career in social work, this is one of the most versatile careers possible. MSW degrees are portable and are recognized throughout the United States and around the globe. While licensing in a state or territory may not be transferable, the MSW degree is. This gives social workers great flexibility. Social workers can choose not only the population or target audience they wish to serve, but they can also decide if they want to work in the public sector, the private sector, or the non-profit sector. Social workers are not limited to direct service only. Their work can and often includes organizational leadership and consulting, program planning and staff development, public policy work and legislative work, and advocacy. The other thing I like to share with those considering this field is the satisfaction of having my career values, my politics, and my spiritual belief systems all in alignment! 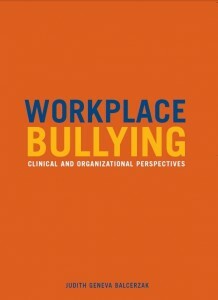 Workplace Bullying: Clinical and Organizational Perspectives is now available. For more information about publishing with NASW Press, please contact Stella Donovan, acquisitions editor, at sdonovan@naswdc.org. Judith Geneva Balcerzak, MSW, PhD, LCSW, has worked as a clinical social worker for over 35 years. 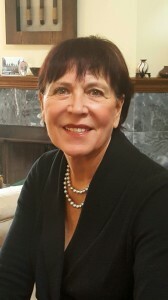 Balcerzak teaches in the Marriage and Family Therapy Master’s Degree Program at California Lutheran University in Thousand Oaks, California. In her private clinical and consulting practice, Balcerzak has encountered many clients, students, and organizations with workplace bullying problems. Her commitment to human rights and social justice is central to her values and practice. What an excellent contribution you have made on this subject, Dr. Balcerzak. I too, was the object of workplace bullying, my manager, of all people, and so difficult to address. I tried to take action with human resource people in a meeting to identify the issues with this manager, and was discouraged by them….”are you sure you really want to do this?” In fear of losing my job, I buckled under pressure and endured. There was not even the slightest discussion of “bullying”….it was not even a word that was acknowledged at that time… While no one should have to be subject to even subtle chronic abuse as I did, the positive that came out of it, which took me years to realize, was that I had “learned” to deal with the most difficult person in my work career. I did grow from this experience., but it did take it’s toll on me mentally and physically. When I was finally able to transfer out of the situation, it made me realize and value, to this very day, the positivey and goodness of a healthy work environment. I try to encourage and promote this, particularly with young people I work with, at every possible opportunity. Thank you for writing this book, Ms Balcerzak. I too was the target of workplace bullying. It was at a time when the term ‘bullying’ was not generally applied to the workplace. My experience was of the director of a program I was working in bullying me, and instigating my co-workers to join in the bullying. The director was a physician heading a program at the major hospital where I was employed. I sought the help of the Human Resources Department, as well as my social work supervisor. But these sided with the doctor, a very frightened, insecure man, who tolerated poorly professional ability, intelligence, and forthrightness in members of a cultural minority, to which I belong. My resignation was requested, simply because this man wanted me gone. I refused to resign, and I was fired. I later filed complaints with government agencies, and was issued a right to sue. I was able to sue, and win, for my unemployment compensation, which this man had tried to block. But lack of funds kept me from taking further legal action. I went on to have social work positions that were more rewarding, and where there was less bias. Again, many thanks, for a book long overdue. I am very grateful for just finding this and plan to continue its use. I am currently going through this now at my work and it has been going on for some time with me trying to use the proper legal channels, and finding that it is a very slow process. It is very disappointing to say the least how many social workers and other professionals play a part in this and do not recognize that they are even in it for fear of not being accepted by the larger or louder or so called leader of the pack. It is disheartening to watch others, including my professional peers lack the moral backbone to stand up for what is right, instead fall back to what they see as more popular. You are right to say that it does take its way with the way one feels about many things. I no longer have faith in others and find that I am emotionally disheartened by the people i work around. My profession used to mean something to me, but I see that many can pass a test but lack the moral fiber to call themselves social workers of honest caliber. Lateral violence and workplace bullying should not exist in a place created for health and wellness yet it does and it lowers one faith in humanity, it exists because of the structure of weak leadership where everyone has to play to a weak ego and once you do not then you are used to be set up to fail and those who are left are there to target you in the name of showing you how it is done. Yes, isolation and exclusion are best punishments and then removing you from ways to get your work done, then putting you in the area of looking like you are the “bad” person and public and professional smear campaign is natural since once it is done, you are left to not be chosen for anything after that. And, if you are already someone who is not popular, then this is even another reason that you are given rise to being targeted for actually being isolated. So, it a negative feedback loop of sorts. How do you prove it? Well, the system design covers the employer because they can act like they have an answer for each decision made and the burden to show all that occurred is your burden so your cards are stacked against you. I think the fight has to be one that you are willing to go a round or two that meets your internal, emotional quota, whatever makes you feel good about not having turned tail and ran, then as you stated, at some point you might have to consider your health and be okay with leaving it all behind to become more creative and resilient elsewhere. I know this experience has changed me forever. I will no longer feel the same about my profession. I entered into it years ago to help advocate and counsel others to health and to empowerment. Never have I once “took” anything from another person, I have earned and many have taken from me. I have been stripped of promotions due to discrimination and there being a reason why they wanted that person with the MSW vs. LCSW or someone with less clinical skills than more. There is always a reason for their discriminatory hiring practices–it is made up as they go along. Today, you have one less certificate, tomorrow, you have one too many. It is actually hilarious. You never quite have what you need, and they never have what they need, but it is always okay, they can be groomed and you cannot be because of what? I give up! I no longer care. The world is not color blind, social work is not color blind. It is what it is and all we can do now is try to make a difference where we can. I have tired of hitting my head against the wall of discrimination and racism and coming up battled-weary. Let the young take up the armor and fight onward. I know the truth and no matter what it lies around the fact that we are a threat to the weak, the people who need to stay in charge by any means necessary, and the most difficult thing to swallow is they choose other weak minorities to act on their behalf and it is like the slave hunters enslaving their own people or trying to capture them for slavery. I am not being enslaved. I am leaving the pack of enslaved because it is a choice when you see that you have one. It is has always been by choice to remain and fight or to leave and become creative in other ways. I now choose to leave and become more creative. One cannot tie up one’s mind and I am not owned by man. I thank you for your sharing, and I plan to add to the topic because it is another form of bullying for a minority person, woman of color, when it is done by an establishment full of whites who make it known they are doing it, and yet defy you to do anything about it. It is sinister, mean and downright diabolical, and yet, difficult to prove–they all hang together against you….so where can you turn? You are automatically wrong, just for being the odd person out, and so what there can be a person of color around here and there, they are used to be there for them so you are still out, no sanctuary–you are blamed for being your color, race, gender, and not playing by the rules…..does not matter if they are wrong, just follow along. This is another book for another time, and it has a deeper emotion for now one gets to look in the mirror each day and try to understand why? The bullying is more than work-related, it is very personal. Thank you. I work in higher ed and introduced Mobbing to my administration 15 years ago as a union president . No changes ever. “It’s a European thing. It doesn’t happen here”.